Just six games survived the weather in the Central Midlands Football League. In the Black Dragon Badges South division Southwell City must have wished there had been a bit more rain at Eastwood Community, as their hosts ran riot, with ten goals finding their way past the visiting keeper. Steve O’Connell registered a hat-trick, while Louis Bentley and Dave Worger added two apiece with Ross Marriott, Danny Guild and an own goal taking the total into double figures. 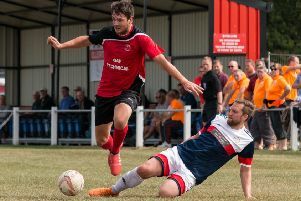 Hucknall Town missed out on the opportunity to overhaul Belper United at the top of the table, as visitors Pinxton came from a goal down to win 2-1 at Watnall Road. Hucknall went in front two minutes after half-time thanks to an own goal, but Danny Evans equalised on the hour with a superb free-kick and Pete Stubley got the winner ten minutes later. Collingham started the New Year in style, picking up their third win of the season as they saw off Linby Colliery 2-0 at Station Road. After a goalless first half, Euan Morris opened Collingham’s account on 49 minutes, Martin Wapplington scored the second with a delightful lob over the Linby keeper. Linby had their chances but failed to find a finish. Phoenix kept their good run going with a convincing 6-2 win over Welbeck Welfare. Steve McDonnell led the way with a hat-trick, with Rob Gorman, James Cregan and James Lawton also finding the net. Bilsthorpe picked up a welcome three points with a 2-0 defeat of Askern at Eakring Road. Nick Langford gave them a 16th minute lead, Paul Leatherland doubling the score three minutes after the break to give the home side a second successive home win.